This was an excellent project. It’s very useful to “master” IR communication. Today I was simulating a Transformerless Power Supply with LTspice. I was having a little trouble and them I asked for help here (http://www.eevblog.com/forum/index.php?topic=2486.0). Do you know eevblog (http://www.youtube.com/user/EEVblog#p/u/7/g7b5YZENvjY)? It’s wonderful blog too! Great job ! Cant wait for documentation. I have same remote but want to use it to control volume pot on amp. 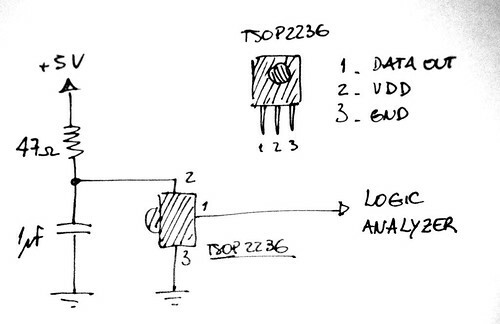 a question, why the rc filter on the power supply at the tsop? it was meant for what? It’s suggested to suppress supply disturbances. Awesome project!! I have been thinking the same. I too have a samsung one. Can i look into ur codes, pls? Yes, of course. I’m finishing the code to post it here. Maybe this weekend. Thanks. 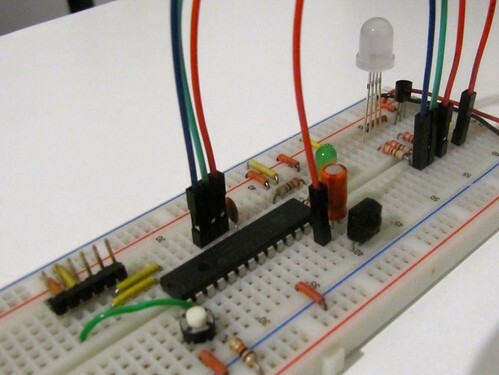 because your article i success built IR Receiver with AVR micro controller..
Great news! I hope you make more things with it. Very very thanks for it’s document. do you have any clue to figure out checksum algorithm? 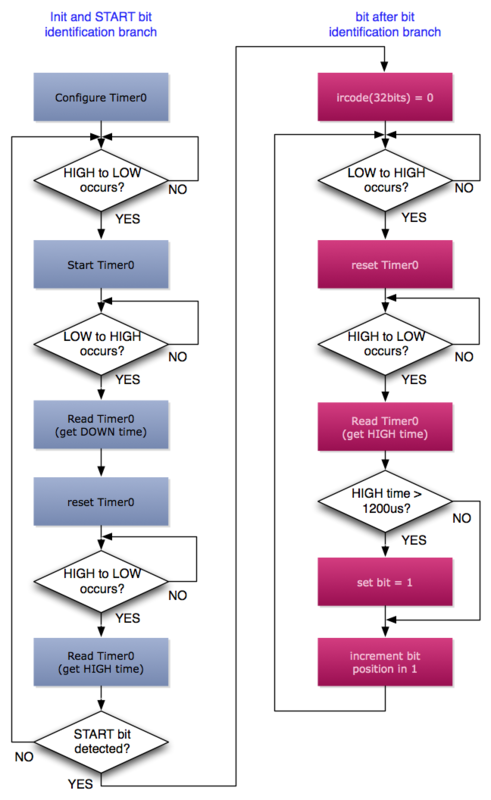 Can you explain more about the message format? Where is the checksum computed value? Where is the data? 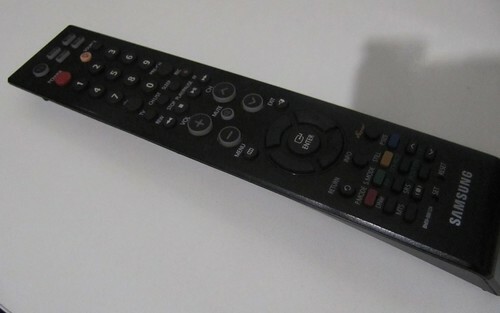 Great write-up on re-using the TV-remote for Non-TV purposes. Thank you for the write-up. It’s very helpful! One question, would a IR receiver with different carrier frequency, e.g. TSOP4838 (carrier freq = 38kHz) work with Samsung remote? Thank you for comment. I had never tested this receiver specifically, but I think yes. Some receivers has very wide filters, because the filter curvature is very low and works even with 40KHz. Thank you for your prompt reply. 🙂 I will give it a try. where did you connect the 555 timer? Hi Islam, you are right! I don’t know why my code work with my bit duration, but I’ll correct the article with your tips. Thanks a lot. 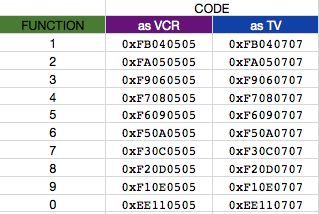 where is the rest of codes? When I wrote this code I only need some functions. If you can catch the logic behind the protocol, you can easily produce the rest of functions. And you probably has these skills, cause you correct the code for me. Thanks again. After these project and some others I give a pause in Microchip PIC projects. Now I really want to abandon PIC and work with ARM, or maybe AVR. I’ll post about that soon. Thanks a lot for reply…but before you left PIC please please give me the rest of codes ….i saw a lot of pages for Samsung…most of them speak raw data codes which i can not realize the code…..Please help & support…. remember …your page was the first step for me to access my home devices. …first one was button”1″ and then power on/off found it so hardly……..and simulated it successfully so waiting for rest of codes………………. First of all , i appreciate you . I did my system according to your tutorial . I am curios on are there any command definetly shut down television (it does not matter television on which state), or where can i find it ? I really don’t know if there is such thing. The Samsung documentation is very poor about inside features. I have a PIC 16F877A, and I want to control my TV through the PIC, I read the protocol of samsung’s, but where shall I found the function table, like what’s the equivalent for volume up in the original remote control. Thank you for the very well made explanation. But why did you want to stop working with PICs? Well, I think that is more about learning new things. I’ve learned about Microchip PIC before graduation. After that, some (much) things change and some kind of interest rise about other plataforms. I still love and apreciate PIC projects, only don’t expend much time with it.